I've got the same problem before and just replaced the oil pressure sensor. It's not necessary to rebuild the pump for a leak on the sensor. If the small hole (on the front in the engine -on the back of the oil pump) is not dripping, it means that the seal is still in good shape. The hole is connected to the hollow spot between the water pump and the oil pump. This hole has started leaking on my bike, does this mean a new pump? @jwab wrote: This hole has started leaking on my bike, does this mean a new pump? Yep, you need to replace the shaft seal on the pump. So I don't need a new pump, or just a seal? Or is it such a job to change the seal I may as well stick in a new pump? How long can I run the bike before I do damage? It only leaks while the bike is running, and stops soon after I switch off. What is leaking - oil or water? @Avenger GT wrote: What is leaking - oil or water? It looks like both, milky oil. You need to replace both oil and water seals. Motorworks and Motobins supply them as a kit. It is not difficult to do if you are used to servicing and maintaining your bike, but you must be careful with the water seal as it is easily damaged. See the thread "Waterpump seal special tool" on this site. You might want to dismantle the pump before you order anything as the oil seal can score a groove on the shaft which might mean a new seal would not work very well. Individual shafts and gears are also available. Your pump should be the later type with a bolt holding on the impeller instead of a nut as on the early type. If it is the early type forget about putting seals in it without changing the shaft, as the threaded end WILL break off when you go to tighten it up, causing you to wreck the water pump seal when you then try to remove it. I learned the hard way. Yeah I just checked the other thread and followed the oil pump seals link. Awesome coverage. This bike just keeps throwing stuff at me! Yes you get that with older machinery, but if you can do the work yourself it is not that expensive to keep them going. The good thing about older BMWs is that parts are readily available, and if serviced and looked after they are capable of massive milages. I have read this thread from the bigining, it appears that something may have been lost in the description of the problem. If I read correctly you stated that oil is leaking from the hole where the oil pressure wire exits from the water/oil pump casting. If this is the case I would be thinking that the joint between the oil pump and engine case is leaking, not the oil pump seal. The hole is a void space between the oil and water pump castings. I don't quite understand the milky oil though. I had this problem after an oil pump seal replacement, it took 3 attempts to get the joint leakproof. The manual states that a 3Bond product is used on the joint, but the product wasn't available so I used Loctite 515 Master Gasket, but Loctite PrimerT was required first, and do not touch the surfaces after treating them with the primer. 1) the leak from the big hole where the sensor wire routes is due to a sealing issue between the pump and case. There is a tiny u shaped channel that is the oil return from the pump. It is very easy to fill that with silicon if too heavy handed when fitting the pump, it oly needs the slightest smear. A very good technique is to tighten firmly by hand and let set for an hour before the final torque. This will prevent silicon from getting dispersed everywhere. Dont use silicon however, Permatex grey sealant suitable to oxygen sensors is a suitable product. 2) If you have a milky mess dripping out of the weep hole at the front of the sump then you also have both the seals have packed a sad, this is bad and needs urgent attention. Sad for you if the shaft needs replacing, but pop the front cover and check to see if there is a bolt or nut, if the former then at least the newer parts are in place and it may just be seals which is a lot better. In my case, brought from a dealer who had done a water pump upgrade prior to sale, but took two years before the slow leak appeared. I could not believe how much clear silicon that they had used...very unprofessional. Make sure you degrease the meeting surfaces of the pump and the block with a suitable cleaner. Really! and then the slightest smear of the sealing compound, not a bead. Stephen, you've got me worried now! I recently took my pump off because it was leaking at the pump/engine joint face. It had been fitted with silicone, and I noticed that the small U shape channel was full of silicone, which I removed as part of the cleaning process, but didn't realise the significance of the channel. I've re fitted my pump with High temp. silicone, and it no longer leaks. But now I'm worried that the small channel may be full of silicone, and of course , it's impossible to tell without removing the pump again. I have no idea when the pump was last off before I did it, but assuming the small channel has been blocked for quite a long time, what is the likely result of this blockage? Does it cause low oil pressure, or oil starvation to certain parts of the engine? Should I strip it again to check, or hope for the best? I wonder why on earth didn't BMW just use a gasket in the first place. 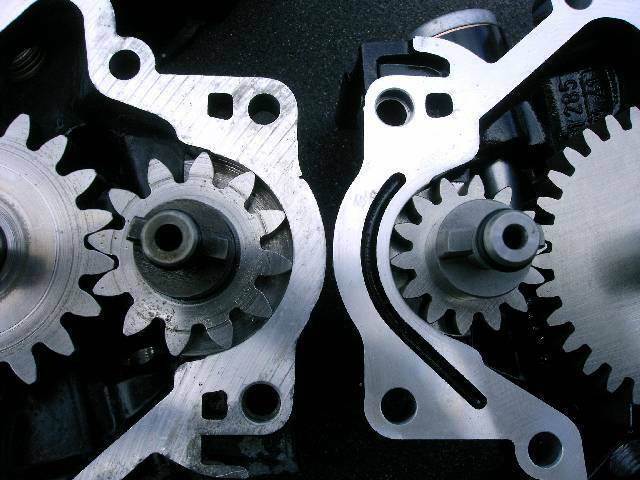 The reason for the metal to metal joint and not a gasket is because the oil pump is a gear pump, which relies on minimal end clearances for efficiency. So use of a gasket would cause that efficiency to be compromised, and in a worst case scenario, if some one was to make a gasket which was too thick the the result would be very low oil pressure and reduced flow. Also, the metal joint assures perfect alignment with the drive, which in this case is from the end of the output shaft. The reason for leaks when using silicone (sometimes) is because the oil pump internal pressure could be as much as 70 PSI (4.8 Bar) when the engine is cold, so there is some serious pressure acting on the case to pump joint. Hope this helps to understand the reason for attention to detail when assembling the pump back onto the engine block. Spend time getting everything clean, do not touch the joint faces with a file as any damage will cause a leak. If the cover is leaking due to small scratches, you could take your pump to a good hydraulic shop to have the pump and cover corrected on a lapping machine. A lapping machine is like a turn table with an extremely flat surface and using a very fine grinding compound (800 to 1200 grits). After an hour on the lapping machine, the pump body and cover surfaces will have a mirror finish. In order to lap the pump, everything has to be removed from the body (oil and water seal too ). Scottie, sorry to have sent your thread off on a tangent, but the oil pump is one of those topics that seems to have have affected a lot of us. When I fitted the new pump I used Loctite 5920 Premium Copper Silicone. I also used it on the timing chain cover. So far so good 600 miles later. I always use the least amount of silicone or any other gasket maker I can on any mating surface and after 40 odd years building and repairing engines I dont think I have ever had to re-make a joint for a leak. There is nothing worse than a pile of silicone sticking out of a joint, because you can be sure that there is just as much sticking into the engine, breaking off and going where it's not wanted! I like the lapping machine, but in the past I have used a sheet of glass and a sheet of wet-and-dry paper clamped to it. Keep the paper wet and move the piece in a figure 8 fashion until the mating surface is nice and shiny. Of course you may not be able to do this on every part that requires a clean mating surface, but it works a treat on those bits you can. Hi Steve, if you are in doubt then yes, you should check it. Its not too much bother and will give peace of mind if nothing else. I have been trying to find the web page that guided me though this, but it had a page from the Klymer manual outlining the refitting of the pump and this return channel, so perhaps you can track that down? This is an odd thing as the pump on my K75 did not have a matching hole, was blank, but the hole is in the block and it was full of silicon, a real neat plug of it attached to the pump! Just the slightest smear in the pump is all it requires as alluded to by AvengerGT above! When I had the flywheel off to replace the rear main seal, I spent quite some time removing little silicon threads that had become lodged in the splines in this area, obviously propagated from other locations via oil delivery(no thanks to heavy handed application)! I am not sure of the risk of damage, but is the cause of oil leaks around the pump as the high pressure return to the sump has no path and forces its way out wherever it can once that channel is blocked. Its so small that you would not think it relevant but as soon as I had the pump off, it made sense as that was the area that the pump was leaking from. Was really odd for me as the front main seal was also leaking, previous owner or dealer had replaced this, but in the assembly process had managed to get the seal to invert and crankcase pressure would force oil out the front of the engine and out this hole also. I fixed that and then found the leak around the pump some time later when I noticed that it was still making the oil pressure sensor wet with oil!! Right then, I've taken my pump back off to check that the groove isn't blocked (it isn't), but I don't understant what the groove is for. 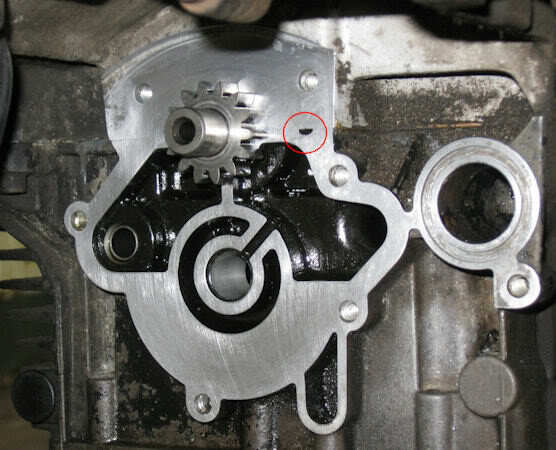 One end meets up with a small hole in the crankcase face (circled red in the photo's). But the other end goes nowhere. I've scraped the groove looking for a blocked hole in the oil pump itself but there is no hole. neither is there a hole in the crankcase. As far as I can see it's a dead end. 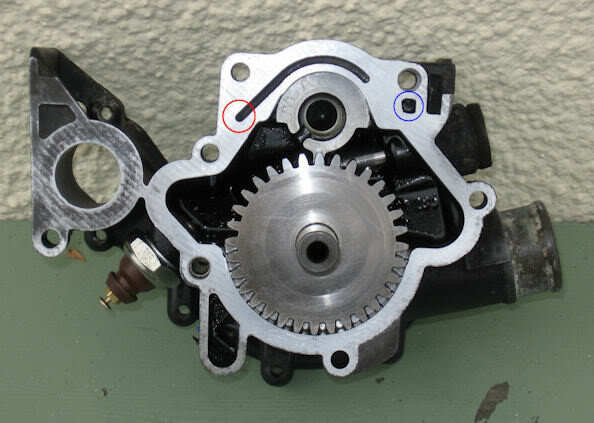 There is a small square hole in the pump too (circled blue), This seems to be blank as well, and doesn't join to the groove. Can anyone shed any more light on what the groove is for, as I just can't figure it out, and I'm reluctant to just put the pump back on in case there is something wrong that I am missing. You really like to quiz us.. I don't have any definitive answer, but here is what I think. This small hole (circled in red) is on the pressure side of the pump. It may be there to catch any leak on the mating surfaces of the pump/engine assembly. It seems to be a simple return to the crankcase. The curved groove also reduces the area of the mating surfaces. Without any seal, a larger surface would be more difficult to perfectly mate. Could you take a small wire and poke the hole to see if its open to the inside of the crank case? This would reinforce my theory. Just for everybody information, because the pump being mounted at the end of the output shaft, when running the engine at full rpm,the oil debit riches 3,500 liters/hour or almost 1 liter/second. In comparison, the same type of gear pump mounted on a /5 flat twin gives only 1,4 liters/hour. 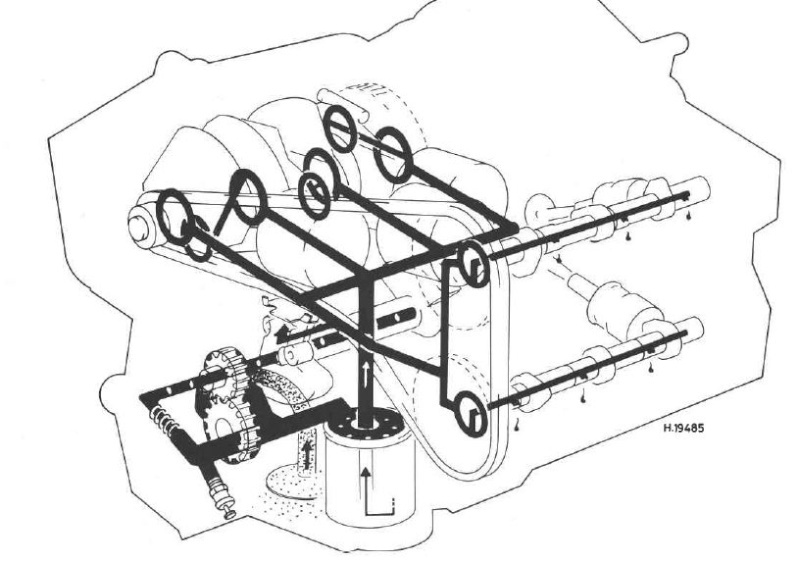 Here is a schematic of the oil circuit. You will notice that this oil passage is not represented on it. You have the later type pump. The early type does not have that groove. The small gear is larger on the old pump and the mating surface ofthe pump is narrower at this point. There are two square holes which go nowhere. I took comparison pictures when I was fitting the new pump, but I can't get them onto the site for whatever reason. Must be doing something wrong. I think Bert is right here. The groove was made to ensure the mating surface is more or less equal between the bolts. This is very important as it is a steel on steel connection with just a tiny bit of sealant in between. It is really important that the pressure on all the area where the pump meets the block is the same. It would be interesting to know if BMW applied the sealant to the inner surface in way of the groove or left it out, creating a preferred 'bleed' opportunity. If the pump is not bolted right (with the right sealant) to the engine they will sweat at the seams. I wonder about AGT's comments above; as far as I know the pumps are exactly the same, but the newer ones had finer teeth (more teeth per circumference).lOve to see those photos! Pic of pumps; old type on left, new type on right. I stand corrected, you were right! I can see why you wanted to replace the old one! Ah, so there are two types of pump! It looks like on the earlier pump the small oilway in the crankcase might have been lined up with the main oil cavity of the pump, and maybe on the later pump the small oilway is redundant. I poked a piece of stiff wire about 150mm long into the oilway and it felt partially blocked, but after pushing it in an out it a few times it now feels clear, and the wire pushes in all the way , so I assume the oilway is just open to the sump. It's all back together again now, and seems leak free. I ended up using high temperature silicone again (but a smaller amount) as I couldn't source anything else locally and needed to get the bike useable again quickly. So fingers crossed that it lasts ok. Cheers for the interesting and educational info. @Kerswellcrank wrote: I poked a piece of stiff wire about 150mm long into the oilway and it felt partially blocked, but after pushing it in an out it a few times it now feels clear, and the wire pushes in all the way , so I assume the oilway is just open to the sump. Thanks for testing that. it reinforce my theory. Again we all learned from this post. Thanks to Avenger GT to share the pictures of the 2 pumps. This forum is like riding a bike. If one find a biker stranded on the road, I believe that we (all of us) would stop to offer assistance. That is really good to see the difference between the pumps. Bugger, I have an old style on my K75 and yet I thought they had the newer ones. It is dated 85 so must be right on the cusp of changes. As long as both the galleys are clear it is all well. Really dumb though that the return channel is so small, but I read that it is only used when the oil is not able to get fully circulated, ie a high pressure relieve path of some sort. All is good in the wonderful world of Bayerische Motoren Werke AG ! @ReneZ wrote: I think Bert is right here. The groove was made to ensure the mating surface is more or less equal between the bolts. This is very important as it is a steel on steel connection with just a tiny bit of sealant in between. It is really important that the pressure on all the area where the pump meets the block is the same. Permatex tube head is not good to make thin line of sealant. Next time I don't use this original head and I'll use hypodermic syringe that I can control the pressure. All I want to know is do I have to seal around this groove or can I use sealant only outside of the groove? Just around the outside would be fine. How about O-ring part? Also sealant outside O-ring?